Look at a photo of a woman peeking through the stripes of the United States flag. What do you see? Would you call it "American Beauty"? Maybe not. Jersey-based brand False Reality encourages exploring different experiences by changing the way you take in day-to-day events and seemingly base objects. The freshman company traveled to Philly to shoot its newest lookbook debuting the Empire Crewneck, an 100% cotton sweatshirt with a screen printed image of the Statue of Liberty&apos;s torch framed by a thin triangle. If you&apos;re immediately jumping to Illuminati-allusion conclusions, that&apos;s good - False Reality joins enigmatic imagery with stuff that passes you by each day in attempts to shift perception. 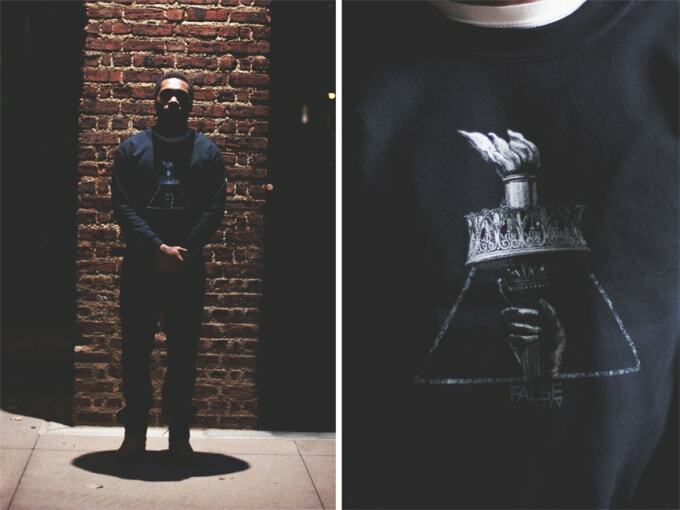 The sweatshirt, designed in the United States, runs for 45 bucks, and can be copped here. Let&apos;s see if you ever look at Lady Liberty&apos;s flame the same way again.